Augmented reality is the use of computer technology to visually expand a user’s environment. It’s transforming countless industries, from gaming to retail, and, increasingly, the practice of medicine, too. A form of augmented reality is being adapted by Cleveland Clinic research scientists and physicians for use in a wide array of clinical applications. Doctors are using a fully self-contained holographic computer—the Microsoft HoloLens augmented reality device—to enhance the treatment of liver cancer, aortic aneurysms, ovarian cancer and even face transplant surgery. Most recently, HoloLens has been incorporated into liver cancer treatment. A Cleveland Clinic research team newly launched a first-of-its-kind clinical trial evaluating the technology for improving the accuracy and effectiveness of a minimally invasive thermal therapy (microwave ablation) to destroy liver tumors. The study is comparing 2D standard of care images, displayed on a conventional flat panel screen, with 3D holographic images, which layer virtual projections on top of the user’s real-world view. This enables the medical team to see the patient’s specific anatomy in 3D. This 3D holographic image is projected onto the patient, giving the doctor “X-ray vision” to better visualize the path to the tumor. Using the holographic image, the radiologist guides a biopsy needle into the tumor with enhanced precision. The team then delivers microwave energy through the needle to heat and destroy the abnormal tumor tissue. Throughout the procedure, the physician uses head-mounted glasses to see the patient’s internal anatomical structures and verify tumor location with the technology’s mini-global positioning (GPS)-like system. Cleveland Clinic’s surgical team was the first-ever to use HoloLens technology during an extremely complex total face transplant surgery, on the youngest patient in the United States to undergo the procedure. 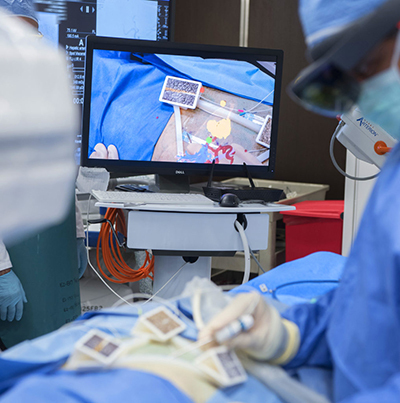 In 2017, the surgical team used the HoloLens headset to overlay a 3D holographic representation of the donors anatomy onto the recipient’s face to assess alignment and refine their surgical plans. In addition to liver tumor ablation, Cleveland Clinic is incorporating the virtual reality technology for aortic aneurysm treatment. Researchers are studying the ability of HoloLens to enhance accuracy in improving stent placement. Cleveland Clinic and Centerline Biomedical, a Cleveland Clinic spin-off company, were awarded a National Institutes of Health grant to test a “holographic GPS system for the operating room” that enables 3D-visualization during minimally invasive procedures. The technique includes the use of Centerline’s novel Intra-operative Positioning System (IOPS) coupled with HoloLens to visualize the procedure in true 3D (as opposed to traditional 2D X-ray). The researchers are using IOPS to control and more precisely place the stent graft within an aortic aneurysm, or other vascular lesion, thereby reducing radiation exposure and decreasing procedure time. Story adapted from the Cleveland Clinic Newsroom.